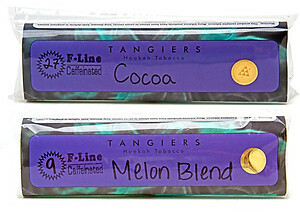 For enthusiasts everywhere, Tangiers Premium Flavored Tobacco is the golden child of the hookah tobacco industry. Produced in San Diego, California by hand in small batches, this highly sought after fine cut unwashed dark leaf tobacco can be slightly troublesome to get your hands on. With a wide variety of flavors, many of which are staples for a solid shisha collection, it's a tobacco that packs a punch in the flavor department as well as a buzz. It is dark in nature with no artificial colors added and very finely cut allowing for it to be beautifully dense packed. It requires a little acclimation before getting the desired outcome and tends to be better suited for seasoned smokers rather than novices. Tangiers F-Line is a unique spinoff of the original with caffeinated versions that will knock you flat on your back if you are not careful. 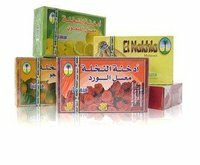 Tangiers has a wonderful variety to choose from and their 250 gram packages allow for Hookah users to smoke several times a month or with large groups of friends. The F-Line line is packaged with orange labeling in an air-tight bag with printed instructions on it and a handwritten label. This package sealed for freshness but is not resealable so make sure to store it at room temperature in an airtight container.